Empty rooms and family photos are reminders of things past, good and bad, now silent and packed away. It’s this sense of loss that Fish & Game’s haunting second piece captures so beautifully, weaving technology into dark fairytale. 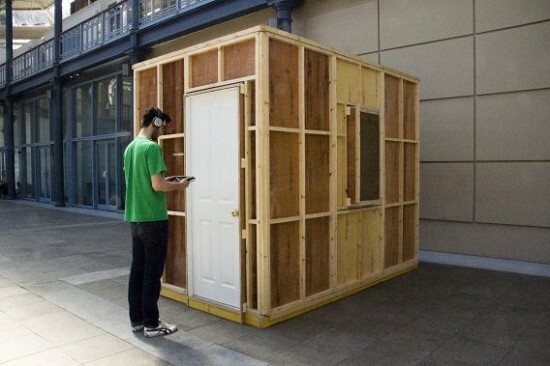 Given an iPad and headphones, you’re placed, alone, before a closed door. An on-screen video, which mirrors what’s in front of you, prompts you to turn the handle and enter what turns out to be a bare white room. Inside is a white cupboard and a bed shrouded in a white sheet like a body in a morgue. An uncovered light bulb hangs from the ceiling. Strings, brass and piano play in your ears with the skip of a dancing child. And as the film pans the room, you’re compelled to do so, too, using the iPad as a view-finder. What follows has the fragmentary intensity of memories half-lost or repressed. As you turn, a pair of shoes appears on the floor; then two children in striped pyjamas enter and play on the bed; day passes into night. As you move around the room, the images become more surreal and disturbing: a woman turns into dough on the bed as her daughter combs her hair. The man at her side turns to stare down at you, mute and accusing. It’s a powerful, unsettling experience as your perspective switches unpredictably between adult and child. One moment you’re leaning over the sleeping girl in her bed; the next, you’re staring upwards into the eyes of someone gripping the sides of the camera as if it were your head. The iPad becomes a window into hidden things; a conduit between past and present. This is theatre as the ghost in the machine – a digital spark that brings to life people who’ve never existed and inscribes them on the surrounding space. it’s often lamented that walls can’t talk but, here, they do. It’s a voyeuristic, strangely self-compromising and unique experience that will linger with you for longer than its 20-minute running time.